Daymond John is a very famous American entrepreneur, the founder of the popular clothing brand FUBU. He is also an investor and a TV star. 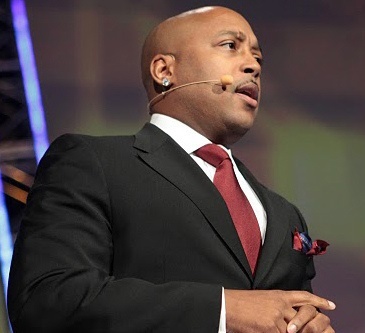 Since 2009, he has been participating in the popular reality show ‘Shark Tank’. He is one of the sharks there – 5 famous business managers who decide whether or not to invest money in ideas presented by normal people. Daymond John was born on the 23rd of February, 1969 (currently 44). As a child, he lived in the Queens neighborhood of New York with his mom and 7 brothers and sisters. While he was attending Bayside High School, he participated in a co-op program which made it possible for him to work a full-time job and at the same time to attend school weekly. This was when the business spirit was conceived in him. price tag of $10 for a piece and actually managed to trade all of their products for just a single day. This is how they ended up with $800 in the evening. This was an immediate success. John went home and persuaded his mother to take out a loan, mortgaging their apartment. They borrowed $100 000 in start-up cash and invested the money into the business. This is how FUBU was born. In the beginning, they started sewing the FUBU logo on t-shirts, jackets and other clothes trying to make the brand popular. This didn’t have a great effect and the business wasn’t really booming. John had to work full-time as a waiter in the Red Lobster restaurant. He worked on his business during his spare time. Things were tough, but luckily he had a friend that would later change his life. This friend was the rapper LL Cool J, who was living in the same neighborhood and knew Mr. Daymond for a while. John managed to persuade the rap singer to wear a promotional t-shirt with the FUBU brand on it on some of his videos (around 40). Later, LL Cool J wore a FUBU hat while shooting a short video clip for The Gap. This gave a good initial boost to the company. In 1994, John exposed his clothing on the popular trade show Magic, held in Las Vegas. Despite FUBU couldn’t even afford to rent a booth, they got orders for around $300 000. They were about to become really popular. In the next years, FUBU signed some decent contracts with big names like NBA, JC Penny, and some others. By the year 1998, the company declared around $350 million in sales. Today, FUBU’s sales are around the jaw breaking $6 billion, Daymond John’s net worth has reached $250 million in 2015. If you liked this post, you can also watch a nice video about the lessons John Daymond learned from his big mistakes. Please, share some social love with us with the help of our cool social buttons on the page! Help us writing more great articles this way!